NEW INFO... If you are having symptoms from spraying, try apple cider vinegar! 3 tbls a day! (morning, mid day, and night) It's a great natural detoxifier, it's cheap, and reports have it that this helps. Let me know if it works for you by signing the guestbook please. Also, I'm baaaack. I'm doing more research and hope to get it up for you soon. Sorry this was not updated more for you in the past, but I didn't want to get into more than I could handle since I've been electronically attacked by '(???)' and was unable to do any updating on this page... until now. The government appears to have a secret spraying campaign conducted from large military jet airliners over populated areas throughout the country. This is a fact. I have witnessed it myself first-hand on March 20, 1999 in SouthWest Michigan, and many other times since then. Also, reports are coming in from all over with similar stories as well. What we do know is that 'they' are deliberately spraying 'something' in the air over our heads, and no explanations or admissions are forthcoming. Now, you may be asking yourself, how can you tell if they are spraying something way up in the sky? Well, all you have to do is watch for the trail a jet leaves in the air. This is called a contrail. A normal contrail occures when a plane travels at a high altitude (about 30,000 ft. or more) and compresses the air into a water vapor or ice crystals through jet engines or the wing tips pushing through the air. This trail disappears after a minute or so due to evaporation, it's water. The kind of contrail that people are reporting as anomalous is one that never disappears, it just keeps spreading out and forming a hazy cloud bank after a while. These trails traverse the whole sky and stay for hours. It is an oil based substance of unknown content that is actually being sprayed from these jets on populated areas. This is what's being called 'chemtrails'. The substance being sprayed leaves a chemical signature, which if you look through polarized sunglasses, you can actually see a strange rainbow effect in these trails resembling oil spilled in water. Most spraying being reported has been done by KC135 military refueling jets, but others get into the act occasionally too. An interesting point to make here is KC135's don't usually fly at a high enough altitude to create a contrail at all. They are a low altitude refueler. Here is a picture of one with the refueling boom extended. If you are still saying "awe common", chew on this. A couple days before our 'sprayday' I saw one KC135 after another come into Kent County International Airport to land. We don't see much military traffic around here and was intrigued. I was driving by at the time and got a real good look at one as it flew across the road directly in front of me on approach. Then, a day or two later, I watched jets make these chemtrail lines in the sky. They flew one after another in a staggered formation making rows like tractors planting crops in the field. They also made specific patterns in the sky near the main spray area (while spraying) and defied usual air traffic controll rules - like flying side by side, or making huge X's and other odd patterns in the sky. They also crossed each others trails too close to one another. Flight paths never cross at, or even around the same altitude in comercial air traffic control. Some are speculating this is done to mark the area for satellite photography. Sounds reasonable to me after watching this be done. Also, after this is done, outbreaks of sickness are common with flu-like symptoms (or worse) in the effected area. Have you ever heard of 1-800-IGOTFLU? Funny how that came around. They even advertised it at the local movie theaters, in case you missed it on the radio or TV. Are they a legitimate flu vaccine testing group, or is that free medical examination and treatment looking into darker projects? The more you check into this, I believe you'll see this is being done. Who, what, and why are questions being asked and researched. If you have any information to offer, goto the guestbook down the page and enter what you know. This can be done anonymously, but we do need to approach this with verifiable information too. If you have seen this in your area, please tell us where and when. If you look up once in a while, you might see it in you area too! I woke up at 8:00am on March 20, 1999 at my brothers house in Kentwood. (on the SE side of Grand Rapids) Noticing the spraying, I started taking pictures. I also took some pictures when the jets flew overhead criss-crossing and the like. The actuall heavy spraying was going on to the SE. although we did get our share of the stuff. Talking with my folks on the phone, they agreed to take pictures from where they are too. They're about 20 miles South of Kentwood in Middleville. The third vantage point was right in the spray zone, from a person in Eaton county. I only have one photo from this area, but it's good! Here is a map to show you how the spray zone appeared to be located. We took pictures from 8:00am to just after noon. After 4 hours of watching this and taking pictures, I ran out of film and quite frankly was disgusted with the whole thing. I think the actual spraying stopped around 1:30pm. These lines continued to spread out for hours, making the sky look more hazy and overcast as the day went on.
' X ' marks the spot! A strange corkscrew effect on this one. It was a clear blue morning! These were taken from a 35mm camera also. Most did not show the true extent of the spray lines due to a setup error on the camera (and the haze in the air), but we did get some decent photos. 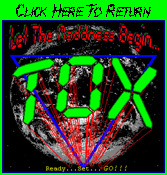 This photo I found on the web from Art Bell's web site. It was sent in by someone in Eaton county and taken on that same Saturday morning. Art Bell has the largest night time talk radio show in history, Coast to Coast. People have been calling in with reports of this happening from everywhere lately. Art doesn't screen calls, he puts you right on the air. Thank God for an open forum like this so we can hear from people in other areas of the world because you won't hear it on the evening news! I would like more of these from Eaton county, or surrounding areas! By 11:30am it was getting very hazy in the sky when I looked to the SE. It's amazing that this was taken that late in the morning with the blue sky showing through. It shows the parallel lines we could see to the SE. They were lower on the horizon, but between over exposing a little and the haze, we didn't quite capture them as well as I had hoped. But here they are!!! I watched as my brother called the Grand Rapids Press that morning and reported the story as it was happening. He called a local TV News channel too. Even though they both sounded really interested in the story, nothing about this ever made it too the public's eyes and ears. Gee, I wonder why? It's time to forget about the media folks. If you see this in your skies; take pictures, get video footage, write down the time and date, and send it to someone who is tracking this stuff. We need to approach this collectively with lots of data. See the links section below. I heard on WOOD Radio-1300am on 3/30/99, that the federal government was in Lansing setting up a quick response team, or network, for a chemical or biological attack on Michigan! I'll put more up on this as I hear it, or see it, or... 'gulp' ...taste it! 3/30/99 - I saw the tail-end of another spray job, but didn't get any pictures. Oh well, A friend did! I can't wait to scan in the good ones and get them up for everyone to see. 3/31/99 - I saw the strangest moon! A low cloud bank drifted past the full moon, but thin enough to see through in a wavy/puffy pattern. The light shining through looked a dirty orange color with a hazy, dirty, rainbow effect to it! Wierd! You could see this with the naked eye. This cloud layer(?) soon cleard out, about a 1/2 hr after I noticed it, to a nice clear sky. Wind was about (10-15 mph) from the SE and it was about 9:30pm. 4/23/99 - West of Grand Rapids, MI got hit hard this evening! It appears to be the lakeshore area from here. Lines filled the western sky and before it got too dark, I ran up to the store and bought film to take some pictures. They should show an awsome triple 'X' formation among other lines. It was at sunset so the lines were an orange color with a still blue sky behind them! Also, it appeared that they stopped spraying around dusk as well. 2 very dense and thick lines were produced from the aircraft leaving the area going in a SE direction. 4/24/99 - I saw some more lines today in the North sky this time. A few other lines were formed overhead, but mostly north of Grand Rapids, MI that I saw. I also noticed an ever widening line from horizon to horizon when I awoke this day in a East/West direction. It was a totally clear sky except for this very distinct wide line that looked by the dispersal to be about 2 hours old. Are they spraying at night around here too? It sure looks like it to me. This was at 7:15am. 4/29/99 - Hello,... Guess what?... More trails today! Especially South of Grand Rapids but also some East of Grand Rapids too. I have some more pictures coming from this spray day as well. 4/30/99 - I took some great pictures today, yes a few chemtrails were seen once again in the area. I actually caught a jet turning on the spray directly overhead! I also took a panorama shot of this trail he left. I was also able to capture a comercial jet next to another trail showing the obvious difference between a normal contrail and a chemtrail. These will be up soon. 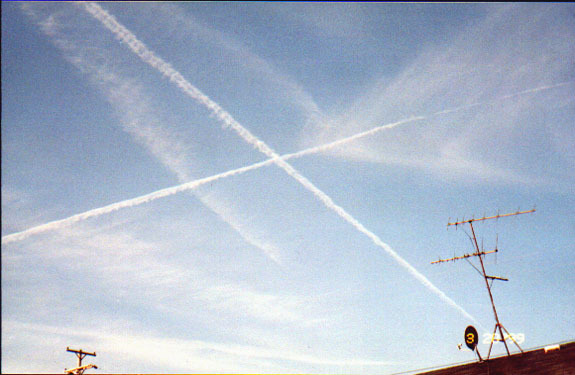 5/3/99 - More lines and "X's" reported today in the morning hours. All over the place. It even looks foggy/hazy when it should be clear. Clouds did roll in later in the day. 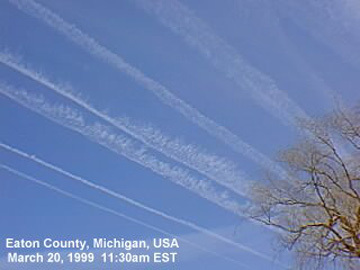 5/4/99 - I hate to sound like a broken record, but, more spraying activity was seen to the North of Grand Rapids in the evening hours today. Definite lines going East and West. They appeared only a couple at a time though. There was even a couple seen in the sky South of GR around 1:00-2:00pm. 5/8/99 - Lines seen to the North of Grand Rapids today. Seem to be East/West in direction in the afternoon hours, 3:00pm'ish. 5/10/99 - Oh, what a day. Heavy activity today in the South sky which after hours worked its way up to directly overhead and past my position going North. Line after line was formed in a general East/West direction, stacking Northward, and making it kinda hazy outside. I noticed this activity first at 1:00pm and can now see lines in the night sky directly overhead and either side in the moon & starlight. I can actually count 6 lines at midnight against an otherwise clear night sky. (I want a night time vision scope!) I think I can see the culprits better at night. Their planes tend to have one very bright strobe light. Commercial planes, I've noticed, have at least two colors of strobing lights. Green, Red, and White or some combination of these 3, but at least two colors. The ones I'm looking at have just the one very bright, strobing, white light. They are going East/West in the sky parallel to the stripes I can see, and not in a regular commercial flight corridor either. Someone care to disagree, or 'school' me in my line of thought on airplane marker lighting, sign the guestbook and I'll consider any useful input. I want to know the truth like the next guy on the street. I'm no different. Oh, I've also had sinus trouble today along with old man's disease. (achy, tired, slow) Other's have mentioned this as well. 5/13/99 - Looks like the Holland area is getting hit tonite. A lot of lines low on the horizon to the West. A couple lines came out this way but was shut off before actually getting to Grand Rapids. 5/14/99 - A nice day, except I watched a low 'cloud' layer move in over the area around 3pm that looked like an aloft spray job. It was even in bands in the horizon. I look through my polarized sunglasses at the clouds in the area of the sun and confirmed my suspicions. It was the most colorful thing. It looked like the clouds were made entirely of oil, the sun made such a strange looking rainbow effect, I couldn't believe it. I have worn these same glasses for years (and they show it) and have never seen this before. I was regreting not having a camera with a polarized filter. I took a couple anyway to see if it will show it at all. This is not a regular rainbow, the colors swirl and are a darker shade. 5/15/99 - Nice day, mostly sunny. No reports, but I forgot to report what I heard on the radio yesterday. The 14th, Saturday, at 3pm and at 3:30pm on WOOD radio 1300am. Some guy from the CDC was saying that we've had a higher rate of flu-like illnesses and deaths around here than normal. He also said they weren't tracking those cases though because it's more important to focus on finding a cure for these viruses. 5/16/99 - More People are saying they don't feel very good. Nothing drastic, just feel like blah. I have noticed a lot of people on the West side of Detroit are sick. I talk to people in the area at work, and have noticed many are sick with flu-like symptoms. 5/18/99 - Rainy, stormy later, lost power for a while. I"m sick. I don't feel well at all. 5/19/99 - A few chemtrails seen earlier tonite. I saw a couple crossing in the moonlight drift by at 10pm too. Otherwise a clear, starry night. 5/25/99 - Southern lower Michigan got it this morning! Many lines appearing to make a great panoramic photo shoot, yes you'll see it soon. 5/27/99 - I saw a few wierd chemtrails(?) today. These lines would look thick coming out, but parts of the trail would disappear after a while leaving a dashed line effect. Is this another way to spray more inconspicuously? I don't know... what do you think? Read what others have seen. Tell what you have seen in your area! With The STRANGE HAZE Website! You'll need a Real Player to listen... it's FREE! Contrails: Are These In Your Sky? This is a 'Contrail & Chemtrail' Public Information Ring Site! You are number to visit... pass it along!